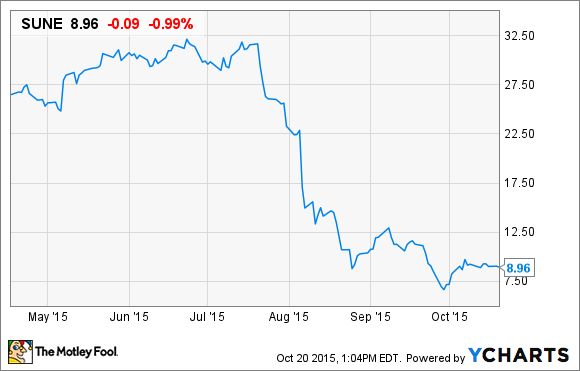 How Can SunEdison Save Itself? This beaten-down renewable energy stock needs a big change in direction. Shares of SunEdison (NASDAQOTH:SUNEQ) have been in free fall since midsummer as investors flee from the renewable energy development company. A string of multibillion-dollar acquisitions, the decline of its yieldcos, and continued losses have spooked investors who once thought this was the best play in renewable energy. Despite all of the challenges facing SunEdison, it does have some interesting assets in its portfolio. Here's what I think this company needs to get back on track. The acquisition of Vivint Solar (NYSE:VSLR) was a disaster from day one. In fact, that's when SunEdison's stock peaked and started its dramatic collapse. Cutting ties with Vivint Solar could give the market confidence that SunEdison is sincere about getting back to building utility-scale projects and selling them for a profit, or holding them long term. Vivint Solar is a residential solar developer, so it certainly doesn't fit in that model. Both companies would probably be better off separate from an operational standpoint. Financing the acquisition could also be a problem. TerraForm Power, SunEdison's domestic yieldco, was supposed to pay $922 million in cash for Vivint Solar's 523 MW portfolio of solar assets, but a declining stock price makes that nearly impossible. The acquisition of Vivint Solar didn't make a lot of sense in July, when it was announced, and backing out of the deal is the first thing management should do to get SunEdison back on track. As SunEdison's business has grown, so have its debts. As of the end of the second quarter, the company's debt load stood at $10.7 billion, which does include debt consolidated from subsidiaries. But billions of dollars are needed to fund the 3.3 GW to 3.7 GW the company is planning to build next year. The current plan is to put most of those projects in warehouse vehicles, which are essentially temporary holding chambers for solar projects. SunEdison could sell projects from warehouse facilities to yieldcos down the line, but in the meantime, they come with high debt and equity costs. I would like to see management sell even more projects to third parties, or to its yieldcos in the near term, even if it means the yieldcos' dividends don't rise as fast as previously planned. Finding long-term financing for projects and bringing the core business to a steady state is necessary to regain the market's confidence. Management's focus on hitting incentive distribution rights (IDRs) quickly is one thing that's hurting both the yieldcos and the parent company, so abandoning that goal would be a positive move for SunEdison's health. What will keep me out of SunEdison stock for the foreseeable future is the fact that the company has little to no differentiation from other renewable energy developers. It buys commodity solar panels, uses standard wind turbines, and uses off-the-shelf inverters. It was essentially using financial engineering to justify its lofty valuation before this fall, not technological differentiation. SunEdison needs to find some way to differentiate itself long term. I thought that might have been with energy storage after buying Solar Grid Storage, but all of the staff from that company has reportedly been laid off as SunEdison cut back. I don't know how SunEdison could differentiate itself now. Solar panel manufacturers with high efficiency are already building their own systems, wind doesn't have much differentiation, and energy storage doesn't yet have a business model. Differentiation is probably SunEdison's most important challenge, but also its hardest. SunEdison has built a large renewable energy company, but hasn't built it on a very solid foundation, and that's what should have investors worried. I think there's a long road ahead before a turnaround is complete; this still isn't a stock I would buy today. Maybe if the company can execute on plans to monetize more projects, it'll be a buy someday, but not today.